Paddari is the language of Paddar valley, a mountainous region situated towards extreme north of Pangi, Kistiwar District of Jammu & Kashmir. Paddari language has been placed under Indo-Aryan language family and is the mother tongue of inhabitants of Paddar Tehsil. In rural areas pure Paddari is spoken as they have least contact with the other languages while in urban areas language is influenced by other languages. In general, Paddari language is influenced by urdu, hindi, pahari, kashmiri, Bhaderwahi, Lahauli and Ladakhi etc. There are more than 30 villages in the paddar area in which paddari is spoken; the villages are sparsly located. They have least or no connectivity with city centers. 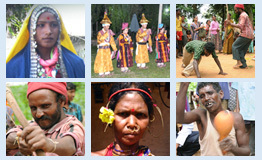 As far as present status of the Paddari language is concerned, there are less than 3000 speakers who speak Paddari as their mother tongue and the number of speakers is decreasing on an alarming rate as other dominant languages are being opt by the locals for better connectivity to the rest of the region. There is no recorded literature in any form and ‘Devnagari script’ has been adopted for writing the language at present. Rich availability of natural resources and plenty of vegetation, the occupation of Paddar is agricultural and there are several Hindu temples which are considered very old and famous site of pilgrimage, also called Michail yatra. Hindu followers visit Paddar in large numbers every year. There are Muslim inhabitants in Paddar as well but majority of the population is Hindu. Presently, an attempt to document Paddari grammar and to produce a Paddari-English-Hindi dictionary and Paddari ethno-linguistic profile is undergoing.